Ten Green Bottles is a popular counting-down game in the United Kingdom, and can be sung to the same tune as the popular American drinking song, "NInety-Nine bottles of beer on the wall." For Pre-K learners, starting with 10 rather than 99, and avoiding a song involving alcohol, makes good sense to us! 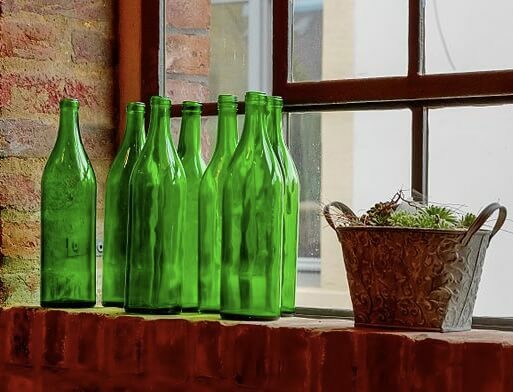 There'll be nine green bottles hanging on the wall. There'll be no more bottles hanging on the wall. Adapt the song to start with a higher number as your child learns to count higher. For example, change it to "20 Green Bottles," then "50 Green Bottles," etc. and count down from there. Then the song becomes an in-the-car game and will take longer to pass the time! If you enjoyed this counting song, you might also like One, Two, Buckle My Shoe. Explore more Pre-K Wordplay! Add Ten Green Bottles to your own personal library.